I should probably introduce myself here. My name is Ann and I have rarely met a craft I didn’t want to try! By day, you’ll find me homeschooling our 3 kids, taking care of 2 dogs and 2 ferrets and happily married to 1 great man. I am also working towards my Black Belt in Taekwondo. Whenever I have a chance, I’m in my sewing room or on the computer working on a new design. I started sewing in my early 20s when I got a wild hair to learn quilting. Why, I have no idea, but I loved it. I am red/green colorblind, which has always made anything artistic a challenge, but with quilting, I could choose bright cheerful fabrics where the color was easy to see. 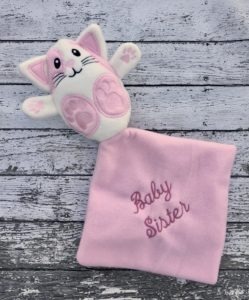 I started venturing into decorative sewing and clothes after I had my first baby. 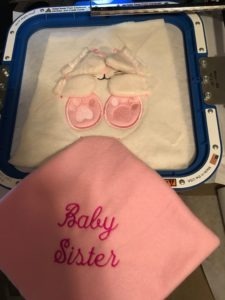 When she was almost two and I was pregnant with my second daughter, I discovered machine embroidery. I saved up and bought a Brother 180-D in November 2004. I bought digitizing software not long after and was promptly in way over my head and set it aside for years but still loved my machine and eventually upgraded to a Babylock with a 5×7 hoop. Fast forward to 2011 and I was introduced to In the Hoop embroidery. Suddenly I had motivation to try again with the digitizing software because there were not very many ITH designs on the market at that time and for some reason it clicked! That was the beginning of my true crafty love – digitizing, particularly In the Hoop designs. Help! I need this in a different format! In their infinite wisdom, each embroidery machine manufacturer uses their own proprietary format. Usually this is no problem, most digitizers (including A Creative Medley) offer their designs in all of the popular formats. Bernina’s format – ART – is the one exception to this for some – I’ll have more about that below. For all other formats, you will usually find that you can get the format you need when you purchase a design. But what do you do if you purchase a design and find that your format is not offered, or the digitizer forgot to include it on that design? I strongly recommend that every embroiderer own at least basic software. With software such as Embrilliance, SewWhatPro or Embird, you can combine designs, change stitch order, stitch multiples of the same design in one hoop, etc. You can also use it to convert to your format if necessary. I’ll have another post another day about my opinions on the various options, but I consider a basic design software to be one of the basic supplies for embroidery. But what if you do not want to purchase software? That is where Wilcom Tru Sizer can save the day! They offer FREE web or desktop software that allows you to: “View, modify, read and convert all major embroidery file types with full design scalability. TrueSizer is based on the same core software as Wilcom’s acclaimed professional embroidery design software.” (I took that straight from their website) The web version is compatible with Mac, PC and even Android devices. Now you can convert to almost any format (except ART). Now what about that ART format? Bernina does not allow any digitizing program but their own to create ART files. If a digitizer does not own this software (which costs several thousand dollars), they either must send their files to someone to be converted, or they cannot offer ART files. I do offer this on request, but the files are large, and so few people request them that I do not automatically include them in the download. I do not have any affiliation with any of the software brands discussed in this article. My opinions are entirely my own, based on my personal and professional experience. None of the links in this post are affiliate links or benefit me in any way. Unfortunately our website crashed and we have been unable to revive it. We are working as fast as we can to restore it. I apologize for any inconvenience this may cause. If you have purchases that were not downloaded, please email me and I will send them to you ASAP. You can find the email address in your paypal or the receipt that was emailed to you at the time of purchase. I will just need to know the email address that you used to make your purchase. Thank you for your patience, we’ll be back as soon as we can!